Lacking a little culture in your day-to-day life? Feel like jamming out to some bongo drumming? Getting sick of Spanish paella and arroz del horno? 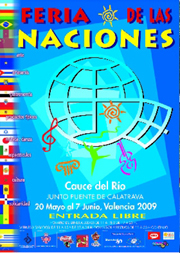 All valid reasons to head down to the Festival of Nations (Feria de las Naciones) starting today and running through June 7th. During the next two and a half weeks, stands from countries all over the world will be selling food, drink, art, clothing and more. Multi-culti overdose! If I remember correctly from last year, most of the stands are from Latin America. Yup, Latin Americans and a lot of Europeans with ratty dreadlocks into capoeira. Entrance is free, and the festival runs for so long that there’s not much excuse to skip it. There are a number of special events so, if you want to participate, make sure to check the program which can be found here.